Invented in 1912, Baseball Billiards is a fascinating group game. Each player has nine innings to score as many “runs” as possible. Baseball Billiards requires 21 balls and an oversized rack. The nine ball is referred to as the “pitcher” and is set at the center of the rack. Home plate is the table’s foot spot. The intended pocket and ball must be called on all shots, except for the break. The winner is determined after all players have had all nine of their innings. The highest run tally is the winner. Baseball Billiard tournaments have been known to draw huge crowds. One Pocket is a skill and accuracy game for two players (or two teams.) Each player chooses a corner pocket and the goal is to score a total of eight object balls before the other player. One Pocket is popular with gamblers, drawing high stakes. One Pocket can be likened to chess, with a beginning, middle, and end game. Players must be careful not to leave a good shot open for their opponent or their opponent may capitalize on that shot, preventing further shots. As the name suggests, Bowlliards borrows its rules from ten-pin bowling. Bowlliards can be used as a training drill. At the start of each frame, ten object balls are racked with the front ball at the foot spot. The first player breaks and tries to pocket as many balls as possible until missing. This continues until all players have attempted. If there are still balls on the table, the first player gets another turn. Players can score a strike or spare, as in ten-pin bowling. The main goal of Bank Pool is to be the first player to bank five balls (or eight, with a fifteen-ball rack) in any order. However, each ball and pocket must be called first, and the ball must be banked off the cushion first. The ball must not touch any others for the points to count, legally. A shortened version of Bank Pool became popular in the 1990’s and early 2000’s. There are several variations of 15-ball. One is to play as you would with 9-ball, attempting to hit the lowest numbered ball first. To play with points, follow the same rules as 9-ball, but balls 1-10 are worth one point each and balls 11-15 are worth two point each. 15-ball can be played with two or more players and all shots must be called. Determine the winning number of points before playing and play until target points have been reached. 7-Ball is a rotation-based game, invented in the 1980’s. Balls 1-7 are racked hexagonally, with 7 at the center, 1 at the apex, and the rest of the balls placed clockwise. After the break, the first player will choose one side of pockets. The goal is to sink the balls in descending order, without scratching the 7. 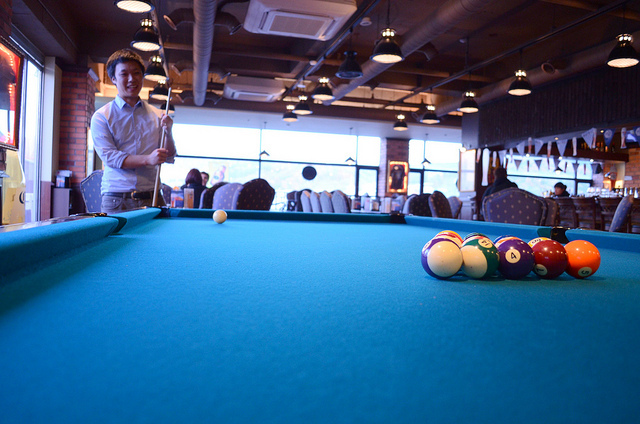 Cutthroat Pool is an exciting game for groups. Each player must attempt to pocket their opponents’ balls before their own are pocketed. After the break, each player claims a group of balls. Once a player pockets an opponent’s ball, they keep shooting until they commit a foul or scratch. The winner is the last player with their claimed balls on the table. These games are only some of the incredible variations of pool that you can play. Every pool player knows a different game or two. You’ll be surprised if you ask around. Game trends come and go. Check out more billiards and pool game tips, here. Looking to purchase a pool table for your home? Visit Gametablesonline.com for the best selection of home pool tables and billiards accessories at prices that you will love!